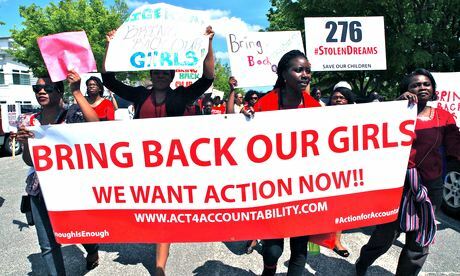 I originally wrote this post for the Guardian Voluntary Sector Network after being struck by the power of the #BringBackOurGirls hashtag in bringing the plight of the kidnapped Nigerian schoolgirls to the attention of world leaders. Three weeks ago, more than 200 Nigerian schoolgirls were kidnappedfrom their boarding school by armed Islamist militants. The event has become an issue of international importance, with a $300,000 (£177,000) cash reward offered to anyone who can help locate and rescue the girls. But the global response started as little more than the outraged tweets of a handful of Nigerian citizens. At first, the world took little notice of this horrible kidnapping. Oby Ezekwesili, vice president of the World Bank for Africa, gave a speech in Nigeria demanding the Nigerian government help to “bring back our girls”. The call was echoed by tweeters in Nigeria using the#BringBackOurGirls hashtag, which has gone on to be used in over a million tweets worldwide. The Nigerian government has listened, offered the reward and accepted international offers of help, with David Cameron and Barack Obama both sending in specialist teams to Nigeria to help. Social media has played a pivotal role in forcing the issue onto the agenda of our world leaders. Hundreds of thousands of people (including the first lady Michelle Obama) have posted images of themselves holding pieces of paper with the #BringBackOurGirls hashtag written on it on Facebook, Instagram and Twitter. More than any other, the campaign has shown that social media is more than pictures of meals and cocktails – it’s a buzzing conversation hub of the important issues of the day. It’s populated not just by friends and family; influencers, journalists and politicians are all there too, poised to respond to the problems that matter most to their audience. Social campaigns as widespread as #BringBackOurGirls are inevitably picked up and taken to newspapers, constituency offices and ultimately the corridors of Whitehall, where online action becomes real. Like the No Makeup selfie campaign however, there is arguably an egotistical element too. For some, a picture of you with a trending hashtag is more of a social statement about you than the abducted girls, one that says, “Hey, look at me, I care about this popular issue just like everyone else!”. Even those whose motives are pure may be kidding themselves that a militant group capable of kidnapping hundreds of schoolchildren will be moved by a picture of a westerner with a stern expression holding a piece of paper. And are such campaigns even effective? Just look at #Kony2012, a campaign to bring LRA leader Joseph Kony to the attention of the world – a powerful, global social media movement. A movement which ultimately failed (Kony is still at large). Selfies and hashtags are unlikely to lead to social change on their own – only real governmental pressure and action can do that. But world governments listen, and act, when enough people speak. Social media is the most shareable, durable and global collection of voices the world has ever seen, one which is increasingly difficult to ignore. Not every charity with their own priority issues should expect their own social media campaigns to go viral. But that doesn’t mean they shouldn’t try, at least locally. Every charity has supporters willing to use a hashtag in their posts, to hold pictures of themselves holding signs with inspiring slogans on them. And they do make a difference. So work with your supporters on a similarly emotive hashtag to rally round – #BringBackOurGirls is a great example, wording which gives responsibility and concern to everyone. Create a Storify of the tweets and posts. Show it to local journalists, councillors and MPs. Not only will it prove your issue matters to people, it will make them act (as the president and prime minister did) to solve it. For more news, opinions and ideas about the voluntary sector,join the Guardian Voluntary Sector Network community.